In Goat Simulator, you can unlock many goats that have special abilities. To unlock them, special conditions or actions need to be met. We tell you how you can get hold of all goats in the game. 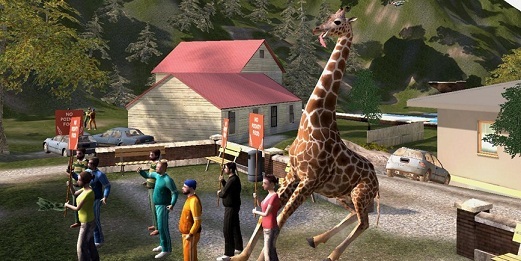 In addition to the standard goat with the extremely long tongue in Goat Simulator you can still unlock plenty of alternative goats. Some you get after a certain amount of success, for others you have to perform specific actions or find secret places. We show you how you can unlock all the goats. Most goats are freely available with a special ability, which you can unlock with the Special Action button. Angel Goat If for 5 minutes standing still after the game started. You can jump higher and float. Evil Goat Bring five bodies of humans or goats for Pentagram in the woods. By means of invocation of a black hole and the Ragdoll mode you can fly. Goat King Go to the spiral tower up near the Spawn and take on the burning throne. You can arbitrarily summon many goats. Ripped Goat Expel all goats from the fight ring in the fields. You're a lot stronger and more damage. Tall Goat Collect 5 GoatVille Trophies. You will be a giraffe. Feathered Goat Collect 10 GoatVille Trophies. You will be a ostrich. You jump higher and glides slowly to the ground. Giant Goat Collect 20 GoatVille Trophies. You will be a Whale. You can watch while barely move but splashing water. Deadgoa7 Go to the music concert, beat the DJ and use the turntables. You wear a blue mouse mask. The background music and people change around you start to dance. Blue Streak Available from the start. You will be a white goat with bright white eyes. Press on blue and spins you in circles. Jet-Pack Goat Available from the start. You gain a difficult-to-control jet pack, with which you can fly. Italian Dinosaur Goat Available from the start. Any object that accesses disappears with your tongue and is used for watermelon. Goatborn Turn the success of "Alexander Goatstafsson" free As the dragon born in Skyrim you can sweep away everything in front of you with a blast. Repulsive Goat Jump in the sewer beneath the bridges of the Goat City Bay. You surround a green stinky cloud knocking back the close objects. Classy Goat Collect 10 Goat Bay City Trophies. You will be a Penguin. You go very slowly but runs very quickly. Shopping Goat Collect 20 Goat Bay City Trophies. To your cart. Rocket Skate Goat Collect 30 Goat Bay City Trophies. When enabled, the shoes, the legs of the goat fly wildly. Builder Goat Find a Minecraft block for activation and another two to all abilities of Goat builder. You can grass, stone and build wooden blocks. Spider Goat Step into Uncle Fred's workshop and run into the floating blue object. Your tongue jumps towards the camera. If its stick to something you will taken to the object. Hitchhiker goat Take the towel with the inscription "42" from the balcony of the skyscraper and bring it to a large UFO. You can send rain whales from heaven. Double jump Goat Available from the start. You can do a second jump in the air. Mermaid Goat Complete the quest "The Mermaid" You become a fish creatures. Old Goat Find the area of ​​the Old Goat Old Goat Mountain. You will be a T-Rex and be big and strong. Jorgen Complete the quest "I Hate Bears" You will be a goat in bear costume and roaring like a bear. Flappy Goat Reach level 10 in the MMO Goat Simulator. You can fly through repeated button. ExcaliGoat Draw his sword in Alvesta with your tongue out of the stone. Miss a beam of blue light of the objects throwing in front of you, but also throws back to you. Wheels Goat Grab the golden wheel at the end of the tunnel in southern Bullgrurzh. You can freeze around and manipulate objects. Burger Goat Reach level 5 in Goat MMO simulator. You can use up hamburgers from your snout. Snail Goat Reach level 15 in the MMO Goat Simulator. You can walk up walls. Hunter Available from the start. You will be a fishermen and can moor fish and other objects to your Angel. Mage (Magician) Available from the start. You can use up cards and a fireball that explodes at start. Microwave Available from the start. You will be a microwave on two legs. You can use up pizzas and you catapult by explosion in the air. Rogue Available from the start. You become the villain in leather armor and can make you invisible. In addition, its objectives can stun. Tank Goat Available from the start. You will be a warrior in heavy armor and can encounter with assault everything aside. In addition, you can trigger by jumping a shockwave. Jousting Goat Missed the horse a headbutt, running around between Goldfields and Mermaid's Tail. You get a horse together Lance, which you can encounter in any direction with the mouse. Anti Gravity Goat Jump in the red glow of the tower on the Old Goat Mountain. You can override and perform so enormous leaps gravity. Zeus Available from the start. Your sparks blue that lead to an explosion. Met NPCs rowing helplessly arms. Inventory Available from the start. You can pick up objects with his tongue and do in your inventory at all times to access it.